I hope more people choose to learn about Sphynx Cats. They may look strange but their personality is loving and mischievous. These cats give unqualified love and are always around asking how you are and can they have a cuddle please. Spend some time with a Sphynx to see if they are the breed for you. May i ask about sphinx newborn kitten? in they 7day old..they skin became thincked, crusty,ad then they eventually death..my vet didnt had any clue what coz it coz it didnt have any experience with sphinx…. Can u all help me what should i do ? You see what you do is maybe talk to a good vet and maybe they will prescribe some kind of cream for its skin. It could possibly help but other then that im sorry i cant help. I think it is a good idea to see a vet about your cat and put some help ful cream on. although a sphynx cat looks entirely bald it does in fact have very soft down fur. I did not know that they have fur? No. I have researched Sphynx cats many times and I also have two of my own and they are from Canada. Hi can someone explain to me why a number of sphynx breeders only allow their kittens to go to a new home if they are spayed/neutered? I am not really interested in breeding its just that I would love to have a male sphynx of show and breeding quality to showhim and if he was successful in that area then perhaps in the future and really I mean perhaps he could be useful to help with strengthening the future lines. If not successful then I would be happy to neuter him. I really am not interested in a female unspayed it would be too much responsibility. Anyway its just a question so I can understand the reasons behind it.Thanks. Hi. I think that the reason why is because many people do not want to take that big of a task to breed them from birth, but I also have two of my own Sphynx cats and one of them I actually breeded from birth and it wasn’t easy, but it wasn’t that hard either. I dont understand the question. Good breeders want all their pet quality males and females neutered. Yhis ensures them that their cats will not be bred just for the sake of having a litter just for fun or profit. The only reason to breed a cat is to better the breed and a novice cant do that. Even if you read thee breeds standard it would be imposssible for you to do that without seeing alot of them and going to multiple shows and sitting down with knowledgeable breeders and learning. It sounds like you dont want a female. The only way a respected breeder will give you a SHOW quality cat is if you have a contract that you will how it to its full potential and then the cat will not be neutered because I am guessing that you cant show spayed or neutered cts. I know you cant show spayed or neutered dogs. I dont think you realize the hard work, time, traveling every weekend and money that it costs to make a cat a champion. I hope I helped you. Can anyone with a sphynx tell me why our neutered female sphynx, 12 years old, will sometimes “wheez” like she is trying to get a hairball up. It usually is only a few minutes and then she is back to normal. Hi. I wonder if you can help we currently have a tabby cat at home but she does not really want or need a lot of love and attention from the family. 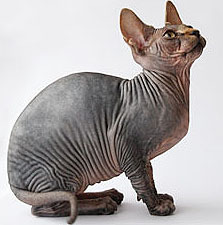 My husband would really like a cat that need and require a lot of love and attention and I heard somewhere that they said Sphynx cats are the best for love and attention. Will you say that this is true? spynx cat are amazing i have 2 very loving very entrtaining very much for people children and other pets. but if you want a cat you feed and it takes its salf off then this isnt a spynx. like to be with you 24/7 love to be the center of attention. love to snuggle up. if you get one make sure its from a good breeder because i couldnt think of a worse heartake than loosing a spynx due to bad breeding.